control cutter.It is a perfect integration of numerical control,precise machinery transmission and fuel gas cutting. complicated pars in the way of programming according to the blueprint. cutting head. Cutting and machining allowances as well as single bevels if any may be specified ahead of time. to fast fabrication and machining. ● High accuracy gears strip transmission, unilateral actuation. ● Precise actuations systematic and reliable main frame. ● Artistic, neat hanging whole arrangement structure. 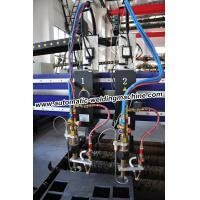 ● Fast highly effective special-purpose CNC controller, facilitates operation. ● Integrations, artistic contour structure and color.